Removable Prosthodontics, Implants, Same Day Model Free Crowns, Full Mouth Cosmetic Reconstructions, Implant and Removable Intraoral Scans cases, along with in-house Handpiece Repairs— RENSTROM DENTAL STUDIO, INC. Early in my career I developed an interest in cosmetic dentistry and digital photography. As I completed and documented more cases, I noticed common issues arising when communicating with the laboratory and delivering final restorations. 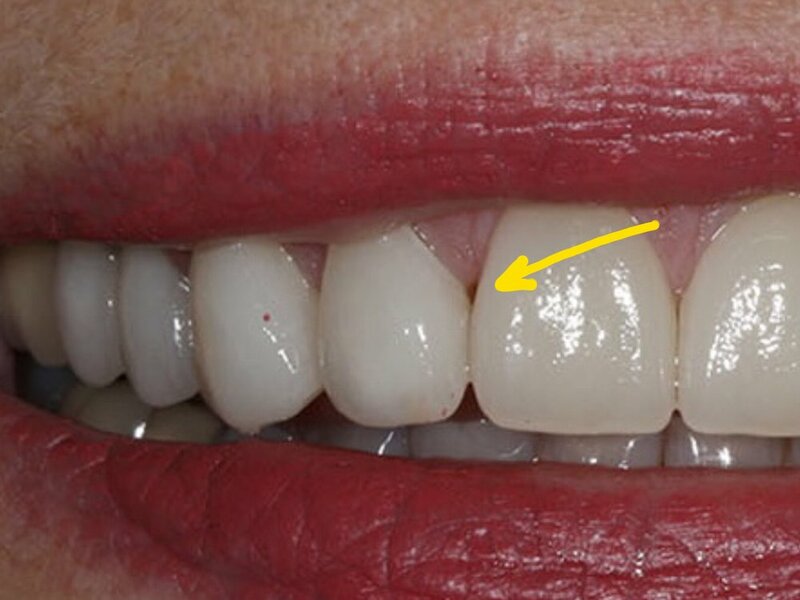 I frequently struggled to get the laboratory to make the interproximal contacts long enough to adequately close black triangles, and I would try in restorations and see exposed facial margins after temporization, and I lacked confidence when deciding if the tissue would rebound to an acceptable position (figure 1). Figure 1; A black triangle upon delivery of veneers. I found that when cases achieved the desirable outcome it was due to luck, and when the outcome was less than desirable it created considerable stress. Individuals have attempted to solve this issue, for example, Willi Geller developed a method referred to as the “Carrot Model” or “Geller Model” in which the individual dies are trimmed and inserted into a model replicating the soft tissue (figure 2a, 2b). [i] The downside to this option is this technique is quite labor intensive for the dental laboratory. At times, technicians have attempted to replicate soft tissue with silicone. The problem with this is often times they replicated tissue that was distorted after retraction. FIgure 2b; In the fabricated Geller master cast, the dies are removed coronally and the soft tissue in the casting is preserved. Additionally, I would rely on statistical averages and share those approximate values with the laboratory, hoping that would be enough to achieve the ideal result. Despite all the efforts, the results were not as consistent as I had hoped. More recently, I have implemented a protocol to deliver results like that shown in figure 3 predictably. Figure 3; Before and after closing a diastema with porcelain. 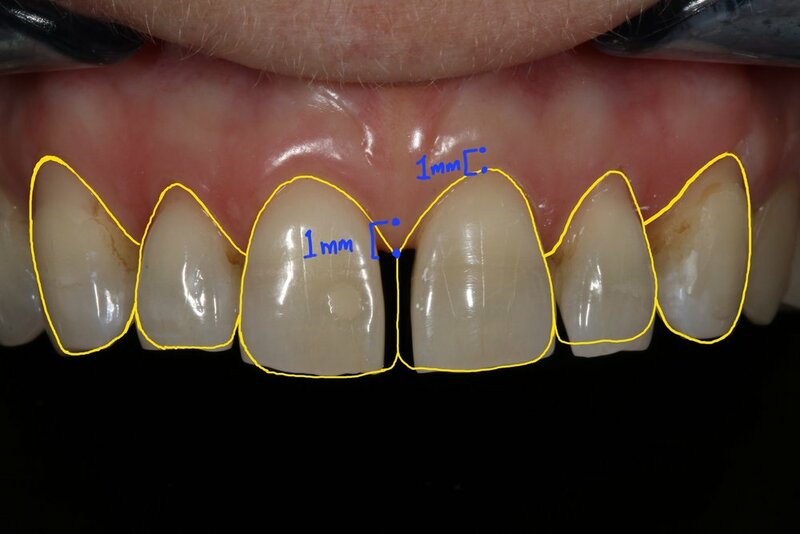 Figure 4; The desired outcome after indirect restorations. So how does one go from treatment goal to desired final outcome predictably? 2. Sound the bone level through the gingival attachment to the osseous crest (with periodontal probe at ~ 45 degree angle). 3. 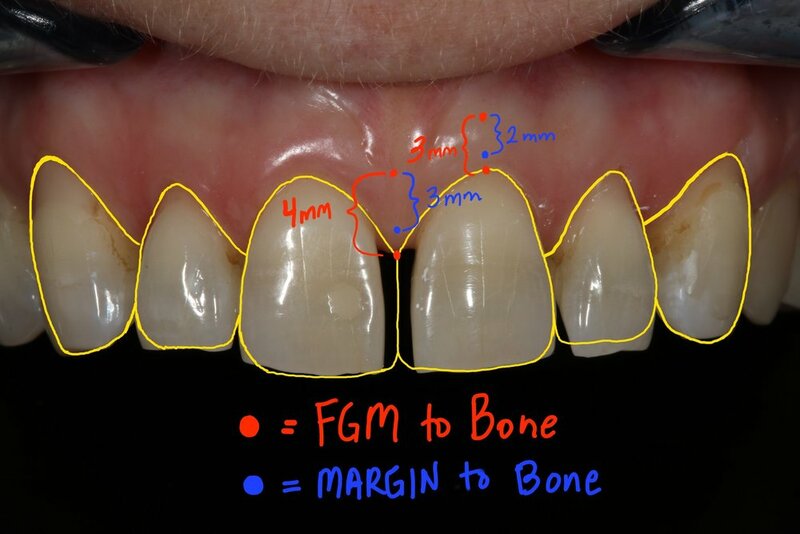 The gingival margin should be 3 mm from bone on the facial and 4 mm from bone interproximally in those patients with a normal crest relationship (figure 5). 4. Prepare the tooth without retraction, margin location should be 2 mm from bone on facial, and 3 mm from bone interproximally. This ensures the margin will not be visible, while not invading the biologic width (figure 5). 5. Instruct the laboratory to make the most apical interproximal contact point 1 mm from margin. This will ensure papilla rebound to fill the black triangle (figure 6). If we have done our due diligence at or prior to preparation, we know the gingival margin and preparation location in relation to the bone. Despite distortion at the time of insertion, we can say with confidence whether these restorations will achieve harmony and proper esthetics with the tissue as it matures, even if a black triangle or visible margin exists initially upon delivery of the final restorations (figure 7a, 7b). Dr. Wessell maintains a private general and cosmetic dental practice on the far west side of Madison, Wisconsin. Having completed hundreds of hours of continuing education, his interests include cosmetic and full mouth rehabilitation, cosmetic bonding, surgical implant placement, and dental photography. Dr. Wessell is currently a member of the Madison Dental Progress Forum, the Academy of General Dentistry, the American Academy of Cosmetic Dentistry, and the Chicago Dental Society. Additionally, Dr. Wessell participates in Spear Study Club and is an avid student at the prestigious Kois Center in Seattle, Washington. [ii] Dimensions and relations of the dentogingival junction in humans. Gargiulo AW, Wentz FM, Orban B.